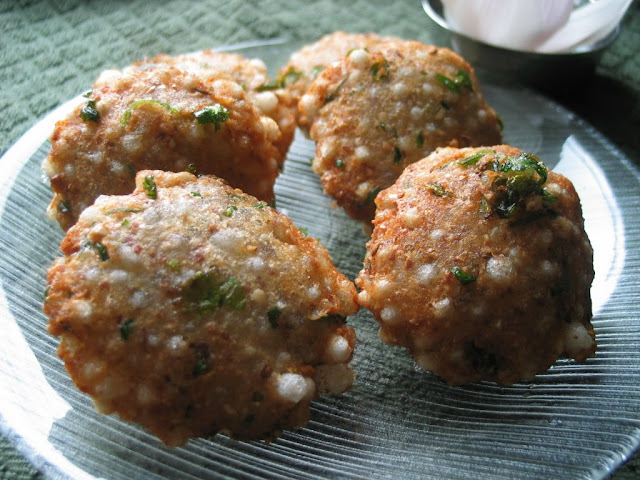 For shivarathri fast i prepared sabudana /tapioca pear vada . Its one of the favorite fast recipe at my home .Whenever i visit Pune the first thing on my todo list to to eat vada pav and sabudana vada . And i love the peanut chutney they serve with it there. At home i usually serve it with plain beaten curd. During my intial days of cooking to i used to be scared of making this vada as at times my vada used to break in the oil and its messy :(. But after many trial and error i now know the proportion of the ingredients for good vada.So here is my recipe :). Coriander Leaves - 1 cup , chopped fine. 1. Mix tapioca pearls , peanut pw, mashed potato , chili,coriander leaves ,cumin and salt. 2. Heat oil to 340 F in a deep pan. 3. Take a golf ball size of tapioca pearl mixture in hand and make a ball. 4. Flatten the ball to a flat disc by pressing between your two palms. 5. Make a few discs and drop a few into the oil. 6. Fry till both sides are golden. 7. Serve hot with Curd or any chutney. yumm.They look so inviting.I love sabudana vadas. Wonderful recipe , looks so crunchy n yummy !!! looks perfect , Nisha :)...This is quite new to me..:)..Would taste heaven, I bet, with a cuppa hot tea :)! Looks very crispy, I have never added peanut powder... Tasty and yummy!!! that's a delicious crispy snack you have there!! 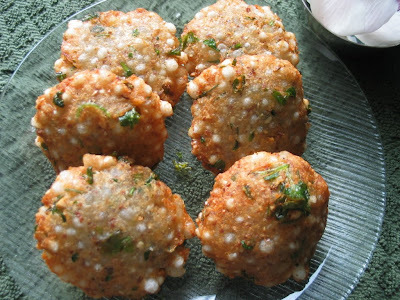 I have never tasted subudana vadais , this one is a new and delicious recipe I'm discovering!! I had a particular question. I was looking for information on tapioca pearls and stumbled onto your blog. I had some payasam recently with "chowari" and found out that it is made from tapioca. You mentioned the use of tapioca pearls. I wanted to know where you bought the tapioca pearls from or whether you made it yourself. On a plus side, I do find your blog fascinating. I'll have to start following this. Thanks Rahul for dropping by , chowari ( malayalam) , sabudana (hindi) and tapocia pearls(english) are one and the same thing. I brought it not homemade. dear nisha cld u plz tell me whether the water in which sabudana has been soaked has to be drained before mixing? Sabudana will usually absorb all the water ,but if there is any water left it will be a good idea to drain it. I found that there are two types Tapioca pearls and casava pearls. According to research casava pearls are really sabudana and that tapioca is not. My mum and I have had this problem twice the tapioca pearls either turn to powder after soak or remain hard. We don't know what to do because you can only find Tapioca pearls.